It can be hard to leave your old life behind. Especially when you're leaving your actual living body behind as well. That's rough stuff! All the sudden, you have to leave the norm behind. No more getting up before the sun comes up and heading to work to bring in a paycheck. No more Saturdays filled with chores and house remodeling projects that you put off until the weekend. No more shopping for jeans, commutes, or small talk in elevators. Actually, now that we think about it, turning over this new leaf doesn't actually seem so bad. Maybe we outta just read this handbook and embrace the ups and downs of being newly deceased. We're looking forward to floating through some walls. Every situation has its perks! 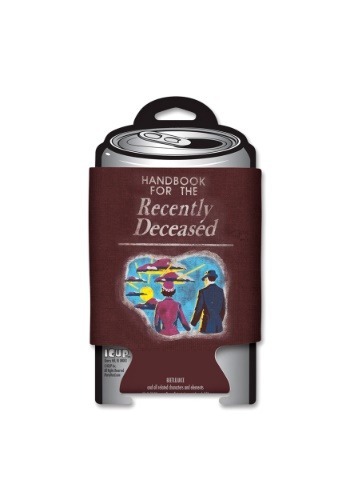 This licensed Beetlejuice can cooler is ready to help you keep your beverages cold and your hand at a comfortable temp! The comfortable foam material has the printed, colorful illustration that's on the front of the guidebook that the Maitland's got after their unexpected accident. Want your Beetlejuice cup to over-floweth this Halloween? Check out the rest of our Beetlejuice costumes and accessories and you'll have plenty to choose from. Looks like it's Showtime!